RORATE CÆLI: De Mattei: To which Church does Pope Bergoglio belong? De Mattei: To which Church does Pope Bergoglio belong? Two anniversaries overlap each other in 2017: the 100 years of the Fatima apparitions, occurring between May 13th and October 13th 1917, and the 500 years of Luther’s revolt, beginning in Wittenberg, Germany, October 31st 1517. However, there are two other much less discussed anniversaries which also fall next year: the 300 years of the official foundation of Freemasonry (London, June 24th 1717) and the 100 years of the Russian Revolution of October 26th 1917 (the Julian calendar in use in the Russian Empire: November 8th according to the Gregorian calendar). Yet, between the Protestant Revolution and the Communist Revolution through to the French Revolution, the daughter of Freemasonry, there runs an indissoluble red thread which Pius XII, in his famous discourse Nel contemplare of October 12th 1952, summed up in three historic phrases, corresponding to Protestantism, the Age of Enlightenment and Marxist atheism: Christ – yes, Church – no. God – yes, Christ – no. Finally the impious cry: God is dead; in fact: God has never been”. The anarchic yearnings of Communism were already implicitly present in the first Protestant negations – observed Plinio Corrêa de Oliveira: “Whether from the point of view of Luther’s explicit formation, all of the tendencies, all of the mind-set, all of the imponderable elements of the Lutheran explosion, carried already in itself, in a very authentic and full way, even if implicit, the spirit of Voltaire and Robespierre, Marx and Lenin” (Revolution and Counter-Revolution, Sugarco, Milan, 2009, pp.61-62). In this respect, the errors the Soviet Russia spread, starting from 1917, were a chain of ideological aberrations from Marx and Lenin which went back to the first Protestant heresiarchs. The 1517 Lutheran Revolution can therefore be considered one of the most nefarious events in the history of humanity, on par with the Masonic revolution in 1789, and the Communist one in 1917. Further, the message of Fatima, which foresaw the spreading of Communist errors throughout the world, contains implicitly the rejection of the errors of Protestantism and the French Revolution. The fact that this interview was published on October 9th by Vatican Insider, considered a semi-official Vatican site, makes one think that this interpretation of the Lund trip as well as the papal intentions, have been authorized and are agreeable to Pope Francis. During his audience with the Lutherans on October 13th, Pope Bergoglio also said that proselytism, is “the strongest poison” against ecumenism. “The greatest reformers are the saints – he added - and the Church is always in need of reform”. These words contain simultaneously, as is frequent in his discourses, a truth and a deception. The truth is that the saints, from St Gregory VII to St. Pius X, have [indeed] been the greatest reformers. The deception consists in insinuating that the pseudo-reformers, like Luther, are to be considered saints. The statement that proselytism or the missionary spirit, is “the strongest poison against ecumenism” must, instead, be reversed: ecumenism, as it is understood today, is the greatest poison against the Church’s missionary spirit. The Saints have always been moved by this spirit, beginning with the Jesuits who landed in Brazil, the Congo and the Indies in the XVI century, while their confreres Diego Lainez, Alfonso Salmeron and Peter Canisio, at the Council of Trent, fought against the errors of Lutheranism and Calvinism. Yet, according to Pope Francis those outside the Church do not have to be converted. At the audience on October 13th, in an off-the-cuff response to questions from some young people, he said: “I like good Lutherans a lot, Lutherans who truly follow the faith of Jesus Christ. On the contrary, I don’t like lukewarm Catholics and lukewarm Lutherans.” With another deformation in language, Pope Bergoglio calls “good Lutherans” those Protestants who do not follow the faith of Jesus Christ, but its deformation and “lukewarm Catholics” those fervent sons and daughters of the Church who reject the equalizing of the truth of the Catholic religion with the error of Lutheranism. All of this brings us to the question: what will happen in Lund on October 31st? We know that the commemoration will include a joint celebration based on the Liturgical Catholic-Lutheran guide, Common Prayer, elaborated from the document From Conflict to Communion. The Common Catholic-Lutheran Commemoration of the Reformation in 2017, drawn-up by the Catholic-Lutheran Commission for the unity of Christians. There are those who rightly fear an “intercommunion” between Catholic and Lutherans, which would be sacrilegious, since the Lutherans do not believe in Transubstantiation. Above all, that it will be said Luther was not a heresiarch, but a reformer unjustly persecuted and that the Church has to recuperate the “gifts of the Reform”. 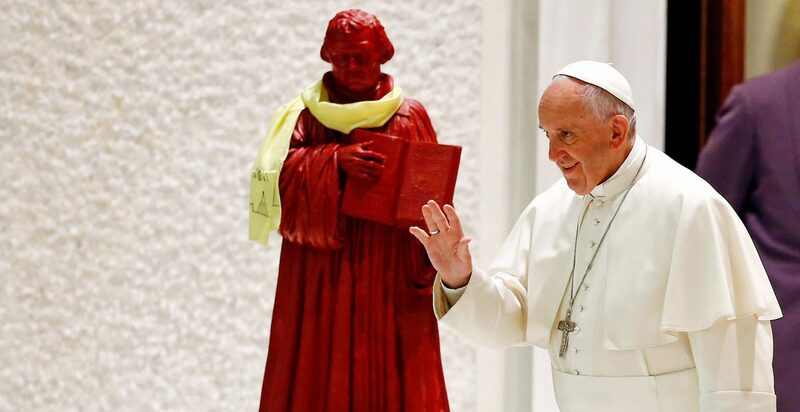 Those who persist in considering the condemnation of Luther proper and think his followers heretics and schismatics, must be harshly criticised and excluded from the Church of Pope Francis. But then again, what Church does Jorge Mario Begoglio belong to?